Hornsagatan is one of the main streets in Söder, lively and full of everything you need to spend a day: coffee, restaurants, pubs, second hand shops, even a theater. While walking toward Slussen, keep an eye when crossing number 50: here the street branches out and one of the two ends becomes narrow and steep, paved with cobblestones and populated by a long series of art galleries: paintings, sculptures, glass and fine Scandinavian art. Well, if you keep walking till number 8, you’ll find my favorite: Galleri Kontrast. 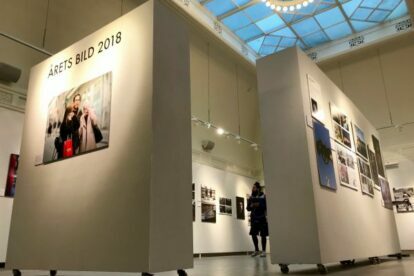 Galleri Kontrast is a photography gallery mainly focusing on documentary photography and photojournalism: indeed, every year the Årets Bild competition (The Swedish picture of the year) finds its space here. The Galleri also helps students from Nordens Fotoskola to get visibility by showing their works, and it’s not uncommon to bump into good work from young photographers. Right at the entrance of the gallery, there is a tiny bookstore with a selection of photo books, postcards and posters: the books are available to consult, and help you to enter the right mood for visiting the gallery. The bottom floor hosts the current exhibitions while downstairs are collected the pictures for sale: from David Bowie portraits, to landscapes, street photography and more. After a lunch, a coffee and a bit of shopping in Hornsgatan, end the day by discovering Stockholm and Sweden through an unusual window.